This tutorial was written by me on March 30th, 2016. Any resemblance to any other tutorials is purely coincidental! You may not copy/paste any part of my tuts elsewhere, but you may text link to them for challenges etc! 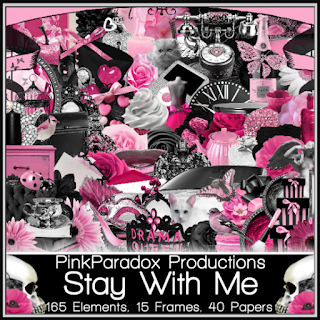 **New CT Tag** Scrap Kit of choice, I am using a PTU Scrapkit called ♥ Stay With Me ♥ By Pink Paradox Productions. Copy & Paste to top layer. Re size & Position add to center top of frame (4) as I have done. Copy & Paste to top layer. Re size & Position add to right top of heart. Flip element if you wish as I have done. Copy & Paste to top layer. Re size & Position add to left side bottom corner add as you like. Copy & Paste to layer just above frame (4). Re size & Position add to center top on frame (4). Add as you wish. Copy & Paste to top layer. Re size & Position add to right side top corner on frame (4). Duplicate as many times as you wish and add as you wish. Copy & Paste to top layer. Re size & Position add to right side center on frame (4). Add as you wish. Copy & Paste to top layer. Re size & Position add to right side center bottom of element (86). Add as you wish. Copy & Paste to bottom layer. Re size & Position add to center bottom under frame (4). Add as you like. Copy & Paste to layer just above element (101). Re size & Position add to right side in the center behind frame (4). Duplicate and mirror image to other side as I have done. Copy & Paste to bottom layer. Re size & Position add to center of your frame. Duplicate and flip the copy. Then we need to select all your layers in the frame and use the erase tool to erase each in the frame. Copy & Paste to top layer. Re size & Position add to right side bottom corner of frame (4). Add as you wish. Flip if you like as I have done. Copy & Paste to top layer. Re size & Position add to left side bottom corner of frame (4). Add as you wish. Flip if you like as I have done. Copy & Paste to top layer. Re size & Position add to center bottom of frame (4). Add where you wish. Copy & Paste to layer just above frame (4). Re size & Position add to center bottom of frame (4). Add where you wish. Copy & Paste to layer just below frame (4). Re size & Position to fit in frame. Copy & Paste to layer just above frame (12). Re size & Position add to left side center more to the top. Duplicate you tube and move copy to top. Then use your erase tool and erase the bottom part of your top layer tube so it looks blended in. This tutorial was written by me on March 26th, 2016. Any resemblance to any other tutorials is purely coincidental! You may not copy/paste any part of my tuts elsewhere, but you may text link to them for challenges etc! 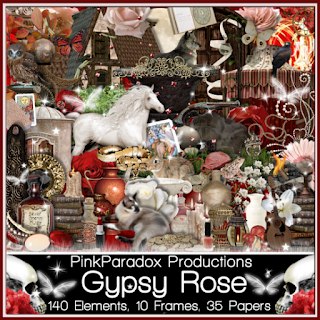 **New CT Tag** Scrap Kit of choice, I am using a PTU Scrapkit called ♥Gypsy Rose♥ By Pink Paradox Productions. Copy & Paste to top layer. Re size & Position add to center then off to right side rotate slightly. Copy & Paste to top layer. Re size & Position add to center bottom of frame (12) as I have done. Copy & Paste to top layer. Re size & Position add to center bottom of your work where you wish. Copy & Paste to bottom layer. Re size & Position add to left side of frames (12). Then select your erase tool and erase what is behind your frames (12). Copy & Paste to top layer. Re size & Position add to right side bottom corner of frames (12). Add as you wish. Copy & Paste to layer just above frame (12). Re size & Position add to right side bottom corner of frames (12). Add as you wish. Copy & Paste to layer just above element (39). Re size & Position add to right side bottom corner of frames (12). Add as you wish. Copy & Paste to top layer. Re size & Position add to left side bottom corner of work area. Add as you wish. You may flip element as I have if you like. Copy & Paste to layer just above frame (12). Re size & Position add to left side center more to the top. Copy & Paste to bottom layer. Flip your tube then place it in your frame and arrange as you wish. Then use your eraser tool to erase what is outside of frame. Copy & Paste to layer just above frame (12). Re size & Position to left side up behind tube. Then flip if you wish as I have done. Copy & Paste to bottom layer. Re size & Position add to right side up behind top of frame (12). Copy & Paste to bottom layer. Re size & Position add to center top and blend in with tube, frame, and moon as I have done. Copy & Paste to bottom layer. Re size & Position add to center bottom and adjust to fit as you like. Copy& Paste to layer just below frame (12). Re size & Position add to left side up behind your tube as I have done. Duplicate if you like to make darker as I have done. Copy & Paste to top layer. Re size & Position add to right side upper corner on frame (12). Flip element if you wish like I have done. Copy & Paste to top layer. Re size & Position add to left side of your tube as I have done. If you wish to add more feel free. Copy & Paste to top layer. Re size & Position add to left side bottom just in front of element (48). Add as you wish. Copy& Paste to top layer. Re size & Position add to bottom center. I have added on the coins but you made add where you wish. Copy & Paste to top layer . Re size & Position add to right side of your last element (42). This tutorial was written by me on March 23rd, 2016. Any resemblance to any other tutorials is purely coincidental! You may not copy/paste any part of my tuts elsewhere, but you may text link to them for challenges etc! 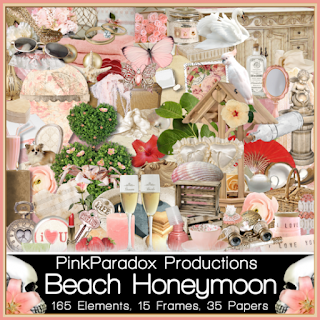 **New CT Tag** Scrap Kit of choice, I am using a PTU Scrapkit called ♥Beach Honeymoon♥ By Pink Paradox Productions. Copy& Paste to top layer. Re size & Position add to center of your canvas as I have done. Copy & Paste to top layer. Re size & Position add to center bottom of your two frames and arrange as you wish. Copy & Paste to top layer. Re size & Position to left side bottom up next to tube. Copy & Paste to top layer. Re size & Position add to right side corner up next to your tube. Copy & Paste to top layer. Re size & Position add to upper left corner and add as you wish. Duplicate if you wish to have more as I do. Copy & Paste to top layer. Re size & Position add to the left bottom corner up next to coffee cup. Copy& Paste to layer just below tube. Re size & Position add to right side center of your frames. Copy & Paste to layer just above frame (10). Re size & Position add to left side up behind your tube as I have done. Copy & Paste to layer just above frame (10). Re size & Position add to center bottom so it looks as if your tube is on the element. Copy & Paste to layer just below tube. Re size & Position add to right side up behind your tube as I have done. Copy& Paste to layer just above tube. Re size & Position add to right side bottom up by tube. Then flip your element if you wish as I have done. Copy & Paste to layer just above element (57) . Re size & Position add to right side bottom up on towels as I have done. Flip if you wish. Copy & Paste to layer just above paper (7). Re size & Position add to center inside your frames and add where you like. Copy & Paste to layer just above frame (10). Re size & Position add to right side center. Use your eraser tool and erase the two trees on the left side. Then duplicate it and mirror image your copy to add to left side. Place as you like. Copy & Paste to layer just below your butterflies. Re size & Position add to top center on your frames as I have done. 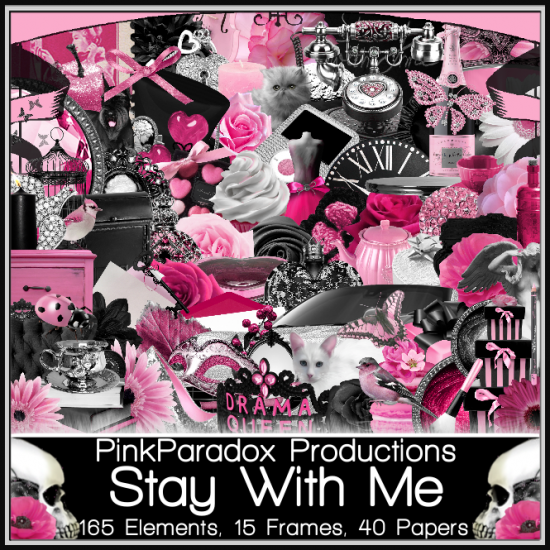 Copy & Paste to layer just above element (160). Re size & Position add to left side middle on your frames and add as you like. Duplicate and mirror image to match on other side. Copy & Paste to layer just below tube. Re size & Position add to right side up in front of element (50). Duplicate to make darker and stand out more. Copy & Paste to layer just below element (73). Re size & Position add to right side up under the right corner of element (73) as I have done. Copy & Paste to layer just below element (10). Re size & Position add to right side up by towels and dog. Copy & Paste to layer just both frames. Re size & Position add to center right above your tube as I have done. Copy & Paste to layer just butterflies. Re size & Position add to center top of your frames like I have done. 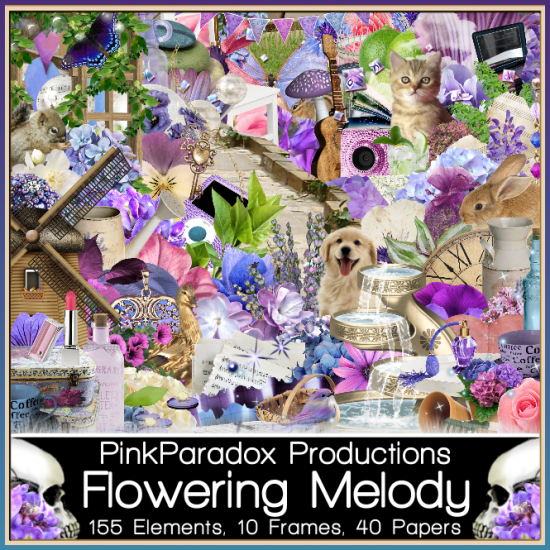 Copy & Paste to just behind your frames and re size to fit inside frame. Then use your eraser tool to erase what paper is outside of frame. This tutorial was written by me on March 21st, 2016. Any resemblance to any other tutorials is purely coincidental! You may not copy/paste any part of my tuts elsewhere, but you may text link to them for challenges etc! 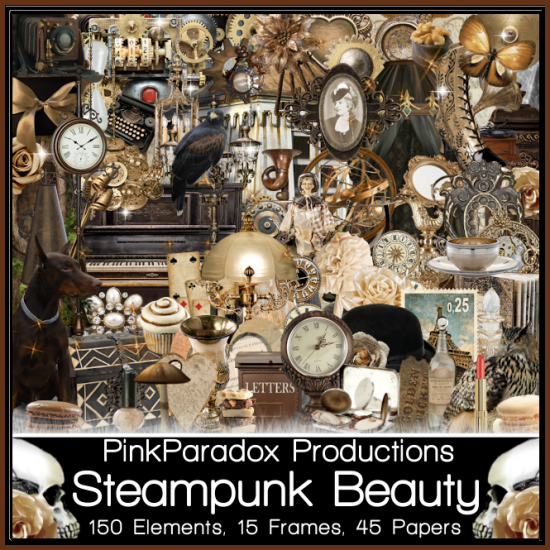 **New CT Tag** Scrap Kit of choice, I am using a PTU Scrapkit called ♥Steampunk Beauty♥ By Pink Paradox Productions. Copy & Paste to top layer. Re size & Position add to center toward the bottom. Copy& Paste to Bottom layer. Re size & Position add to center of your canvas as I have done. Copy& Paste to top layer. Re size & Position add to left side corner on element (28). Add where you wish. Copy& Paste to top layer. Re size & Position to right side bottom toward center on element (28). Copy& Paste to layer just above element (28). Re size & Position add to right side corner bottom as I have done or place as you like. Copy & Paste to top layer. Re size & Position add to bottom center. Copy & Paste to layer just above element (28). Re size & Position add to the right side up behind your coffee cup and rotate if you wish as I have done. Copy& Paste to top layer. Re size & Position add to right side on element (57). Copy & Paste to layer just above element (28). Re size & Position add to right side bottom corner and arrange as you wish. Copy & Paste to layer just above element (28). Re size & Position add to left side bottom corning and arrange as you wish. Copy & Paste to bottom layer. Re size & Position add to left side toward the top of your frame. Flip your element then arrange and place as you wish. Copy& Paste to layer just above element (28). Re size & Position add to center bottom as I have done. You will need to resize. Copy & Paste to top layer. Re size & Position add to right side bottom corner. Add where you wish. Copy & Paste to layer just below dog. Re size & Position add to left side and add as if behind dog . Copy & Paste to layer just above frame. Re size & Position add to right side upper corner of frame. Duplicate and mirror image to match on the other side on frame. Copy & Paste to top layer. Re size & Position add to right side as if on your element (79). 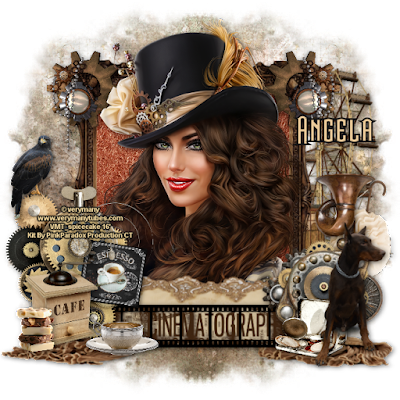 Copy % Paste to just behind your frame and re size to fit inside frame. This tutorial was written by me on March 18th, 2016. Any resemblance to any other tutorials is purely coincidental! You may not copy/paste any part of my tuts elsewhere, but you may text link to them for challenges etc! **New CT Tag** Scrap Kit of choice, I am using a PTU Scrapkit called ♥Heart, Mind & Soul ♥ By Pink Paradox Productions. Copy & Paste to bottom layer. Re size & Position add to center toward the bottom. Copy& Paste to top layer. Re size & Position add to right side right next to element (122). Duplicate and mirror image to match on other side. Copy& Paste to layer just above element (122). Re size & Position to left side up next to element (122). Place as you wish. Copy& Paste to top layer. Re size & Position add to right side up top in corner on element (122). Duplicate and mirrow image to match on other side. Copy & Paste to layer just below tube. Re size & Position add to the left side right behind tube. Copy& Paste to top layer. Re size & Position add to tube or in front of your tube. Copy & Paste to top layer. Re size & Position add in from of your tube and add as you wish. Copy & Paste to layer just above element (122). Re size & Position add to right side up next to element (122). Place where you would like it. Copy & Paste to layer just above element (122). 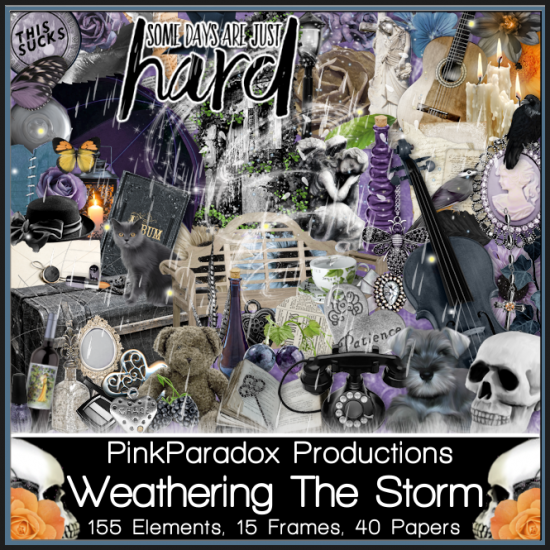 Re size & Position add to right side up next to element (122) as I have. Then flip if you wish. Duplicate and mirror image to match on other side. Copy& Paste to bottom layer. Re size & Position add to top then once you have as you like then use your eraser tool to erase the inside of element (122). Duplicate and mirror image to match on the other side. Copy & Paste to top layer. Re size & Position add to left side of your tube. Copy & Paste to layer just below tube. Re size & Position add to left side and add as if under the candle element. Copy & Paste to layer just above tube. Re size & Position add to left side up next to tubes leg. Copy & Paste to layer just below your first layer of your mask. Re size & Position add so that it is up in the black area where your wording is. This tutorial was written by me on March 16th, 2016. Any resemblance to any other tutorials is purely coincidental! You may not copy/paste any part of my tuts elsewhere, but you may text link to them for challenges etc! 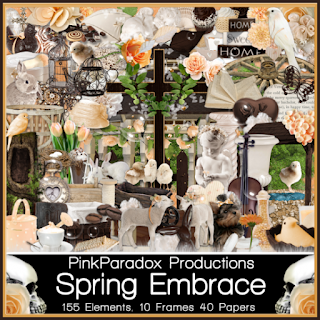 **New CT Tag** Scrap Kit of choice, I am using a PTU Scrapkit called ♥Spring Embrace♥ By Pink Paradox Productions. Copy & Paste to bottom layer. Re size & Position add to upper part center on canvas. Copy& Paste to top layer. Re size & Position add to left side of frame and place as you like. Copy& Paste to top layer. 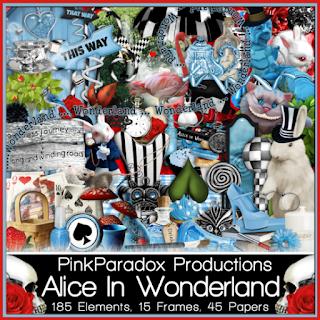 Re size & Position add to right side right next to element (15). Copy& Paste to top layer. Re size & Position to left side up next to element (15). Place as you wish. Copy& Paste to top layer. Re size & Position add to right side up top on your frame. I have flip the element if you wish to do the same. Copy& Paste to layer just above frame. Re size & Position add to left side up behind your other elements and blend it in as you wish. Copy& Paste to bottom layer. Re size & Position add to the center bottom. Duplicate and flip if you wish to fill in more of your work with the grass. Copy& Paste to layer just above element (98). Re size & Position add to either side to the top of your element (98). Then duplicate and mirror image by pressing ctrl+B. Copy& Paste to layer just below frame. Re size & Position add to front of element (90). Duplicate and mirror image. Add as you wish. Copy& Paste to layer just above frame. Re size & Position add to right side up next to element (98). Place where you would like it. Copy& Paste to top layer. Re size & Position add to bottom of your work and add where you wish. Copy& Paste to top layer. Re size & Position add to bottom toward the center of you work. Copy& Paste to layer just above frame. Re size & Position add to blend in behind your little chicks. Copy& Paste to layer just above frame. Re size & Position add to top of wall element. Copy& Paste to layer just above frame. Re size & Position add to left side and blend it in as you wish. Copy& Paste to top layer. Re size & Position add to left upper side on your frame. Copy& Paste to layer just below frame. Re size & Position add to right side up behind angel by the wall. Duplicate if you wish to make it darker and stick out as I have done. Copy& Paste to top layer. 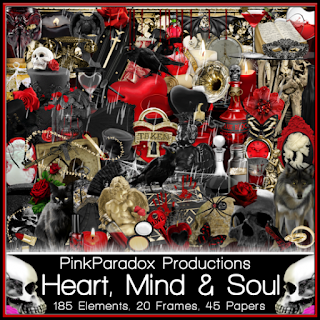 Re size & Position add to right side up by the angel by the wall. Duplicate and make second copy smaller and add as you like. Copy & Paste to layer just above frame. Re size and Position duplicate and then with your copy move it behind frame. Then use your eraser tool and erase parts of your tube to make it as if she is in the frame. Re size & Position to fit your canvas. This tutorial was written by me on March 15th, 2016. Any resemblance to any other tutorials is purely coincidental! You may not copy/paste any part of my tuts elsewhere, but you may text link to them for challenges etc! 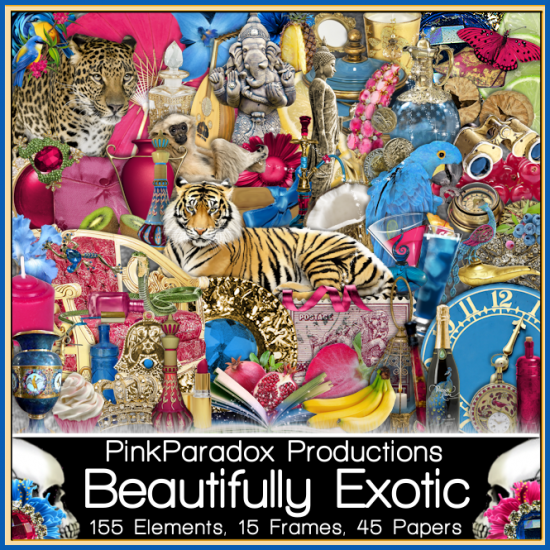 **New CT Tag** Scrap Kit of choice, I am using a PTU Scrapkit called ♥Beautifully Exotic♥ By Pink Paradox Productions. Copy& Paste to top layer. Re size & Position add center of element (101) as I have done. Copy& Paste to bottom layer. Re size & Position add to center and adjust to your liking. Then duplicate and flip or arrange as you wish. Copy& Paste to top layer. Re size & Position to center toward the bottom as I have done. Then adjust and duplicate as you wish. Copy& Paste to top layer. Re size & Position add to right side and place as you wish. Copy& Paste to top layer. Re size & Position add to right side place on top of element (98). Then if you would like it darker as I have done duplicate it. Copy& Paste to top layer. Re size & Position add to the front of element (98). Duplicate and flip as you wish. Copy& Paste to bottom layer. Re size & Position add to either side of the top layers then duplicate and add to the other side as I have done. Copy& Paste to top layer. Re size & Position add to front of fountain. Add as you wish. Copy& Paste to top layer. Re size & Position add to front of fountain up next to element (24). Copy& Paste to layer just below element (24). Re size & Position add to front of fountain. Add as you wish. Copy& Paste to layer below element (33). Re size & Position add to blend in with the fruit or as you wish. Copy& Paste to top layer. Re size & Position add to top of palm tree. Copy& Paste to layer just below fountain. Re size & Position add as you wish. Copy& Paste to top layer. Re size & Position add as you wish. Copy& Paste to top layer. Re size & Position add to top of your work and place where you wish. Copy & Paste to top layer. Re size and Position add to left side bottom on canvas. 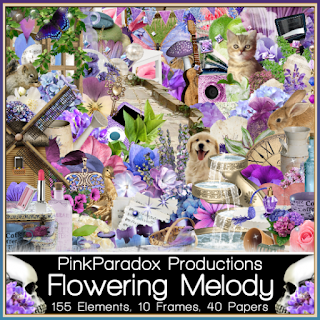 CT Tags For Pink Paradox Productions - Using Kit "Flowering Melody"
With this kit you can do Spring/Outdoors themes...A fantastic selection of elements, to use year round =) . Designed to match the gorgeous "Jennifer" . Fun to work with!Endless fun..
CT Tags For Pink Paradox Productions - Using Kit "Weathering The Storm"
With this kit you can do Dark/Bad Day themes...A fantastic selection of elements, to use year round =) . Fun to work with!Endless fun..
Tube is no longer for purchase. CT Tags For Pink Paradox Productions - Using Kit "Alice In Wonderland"
With this kit you can do Wonderland/Spring themes...A fantastic selection of elements, to use year round =) .Designed to match Verymany's awesome "Alice 2". Fun to work with!Endless fun..
CT Tags For Pink Paradox Productions - Using Kit "Sultry Rendezvous"
With this kit you can do Coffee/Outdoors themes...A fantastic selection of elements, to use year round =) .Inspired by Verymany's "Rosanna." Fun to work with!Endless fun..